Heat olive oil in a large skillet on medium-high heat. 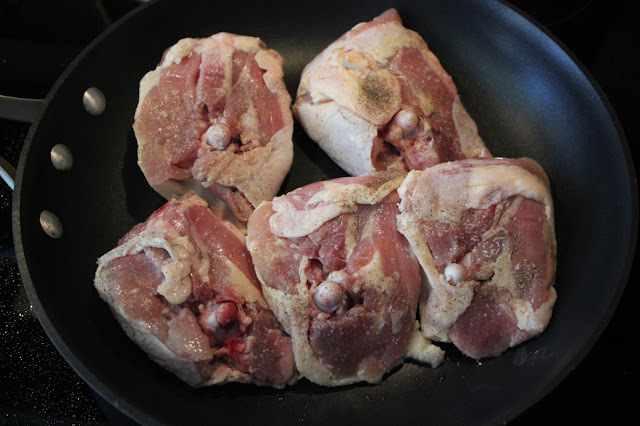 Generously season chicken thighs with salt and pepper - make sure to season under the skin too. 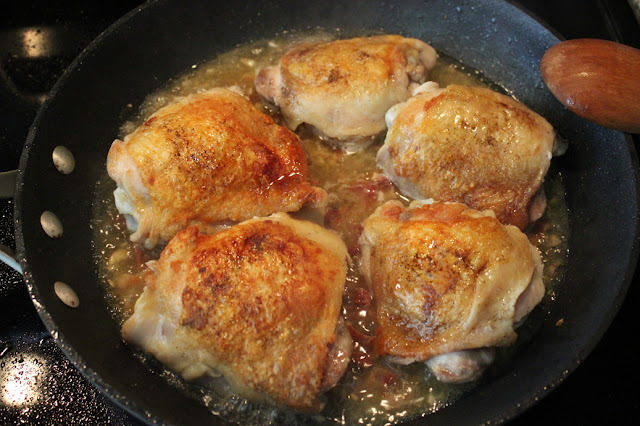 Add chicken thighs skin down to the hot skillet. Cook for about 5-7 minutes on medium-high head, covered, skin side down, without flipping, checking occasionally, until the skin is very well browned. Remove chicken from the skillet. Add minced garlic and a small amount of chicken stock to deglaze the pan and cook the garlic for about a minute. Add the remaining chicken stock (1 cup). Add half the bacon. 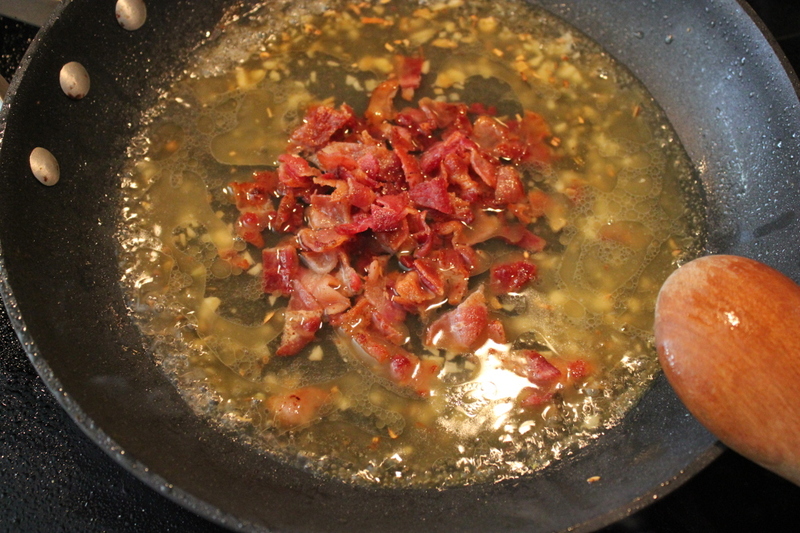 Add chicken back to the pan, on top of the bacon and in the chicken broth. 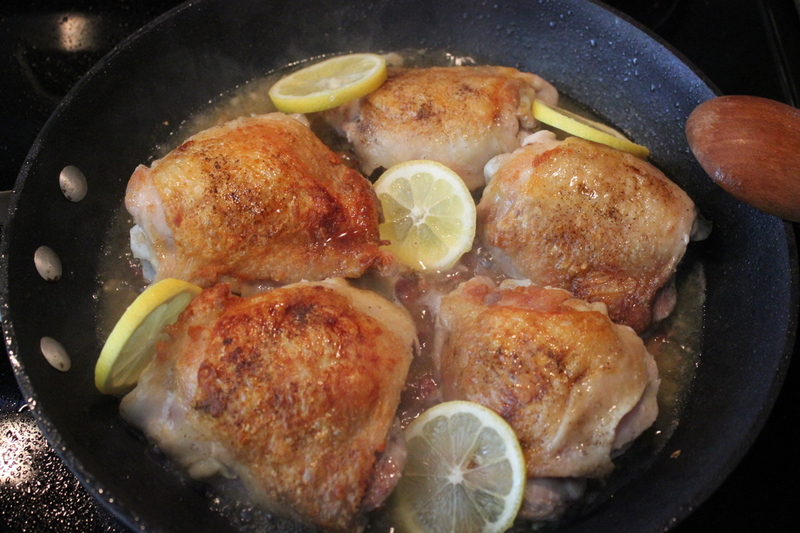 Arrange 5 thin lemon slices around chicken thighs - and cook, simmering, covered, for about 20 minutes, until chicken is done and is no longer pink in the center. 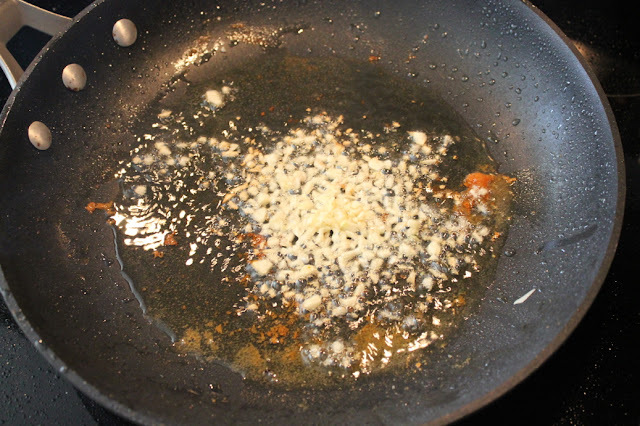 After chicken is cooked, remove it from the skillet. 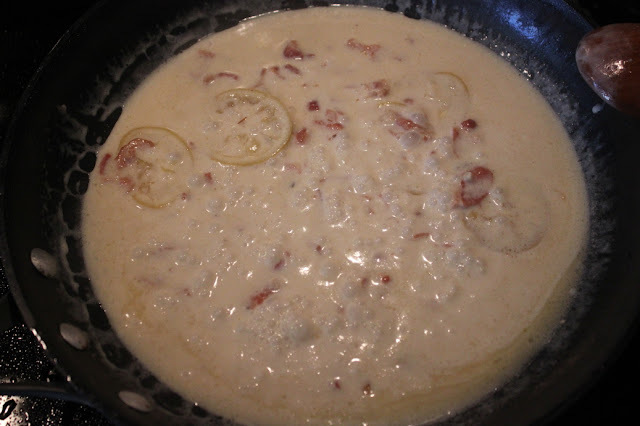 Remove lemon slices from the skillet - it's very important that you remove them now, do not leave them in the sauce otherwise it will be too sour. Add 2/3 cup heavy cream to the skillet. Bring to boil and mix everything well, scraping from the bottom. 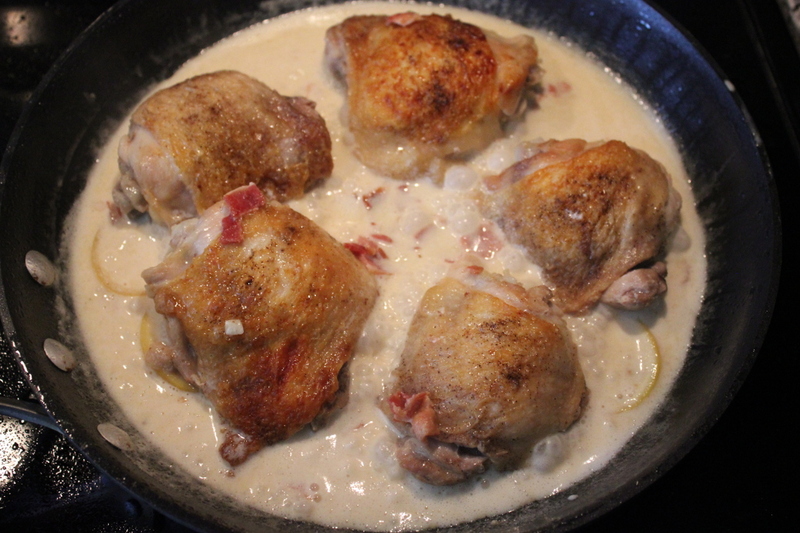 Immediately reduce to simmer, add chicken thighs back to the skillet and reheat. To serve, spoon some of the sauce over the chicken thighs, and sprinkle with remaining chopped bacon and chopped green onions. 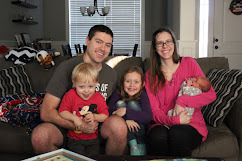 So I'm not sure how the rest of my family felt about this meal but it was delicious! I haven't been too into chicken since my pregnancy with Connor so I have been trying a lot more chicken recipes trying to figure out what I am okay with. 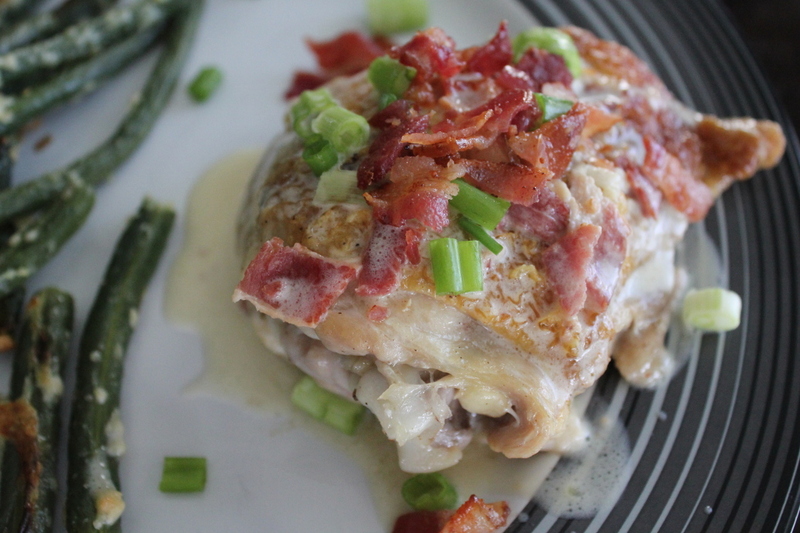 Apparently I'm okay with chicken thighs - because it's delicious! I will make a few notes though. I'm guilty of not seasoning under the skin of the chicken....oops....? It was still good. I also feel like the sauce was thinner than it should have been and would have liked it thicker. But it was otherwise really good. Also a major bonus is that it was super easy. It took some extra time because I had to cook up my bacon first - although if I had been smart I would have baked it instead of stovetop. Oh well. I also didn't completely understand what I was supposed to do with the lemon slices. Was I supposed to put it on the chicken or around the chicken? I have no clue. I think I put them around and felt like it was weird and pointless, but I'm sure there was a point. Comment below: What is your favorite chicken recipe?